Quick question as I know very little of this area. Was Gettysberg just a field? Is the name correct or would fields be better. Either way is fine. my bad explaintation. I mean to move units that between unionist and confederate here will be Wheatfield. much depends also from which hour will be your postions. this map shows how was situation shaped. then (when I look at map which shows moves of armies and I read it right) Wheatfield was between unionist and confederates from the start. do you think it is possible to made "active" map - so anyway to implement moves of armies? Good luck pamoa and have fun. and now some gameplay comment? should I put a "East Cemetery Hill" battlefield between "Rodes/Early at Gettysburg" and "Howard at Cemetery Hill"
Last edited by pamoa on Thu Sep 27, 2012 12:08 am, edited 1 time in total. Hate double posts. As for the second question, what would it do to the map in your opinion? pamoa wrote: should I put a "East Cemetery Hill" battlefield between "Rodes/Early at Gettysburg" and "Howard at Cemetery Hill"
koontz1973 wrote: ...what would it do to the map in your opinion? Accuracy to history is never going to win over game play. And who is to say what went on that day? Just because a book or wiki says something, only the ones there can truly say. I like the idea of opening it up more so as you say, it does not stifle GP. Another thing to consider is to put more attack routes on. Try this for an idea. Have two types of attack lines with a brief explanation, you seem to have room. A solid line for what went on that day for historical accuracy. A dotted line for the ones can could of happened but didn't. Sort of like, can the side that lost win if only they had attacked in this fashion or can the side that won, win faster if only they had.... This will allow you to have some things on that are not accurate to the battle. koontz1973 wrote: Accuracy to history is never going to win over game play. And who is to say what went on that day? Just because a book or wiki says something, only the ones there can truly say. I like the idea of opening it up more so as you say, it does not stifle GP. the generals would be sorted anyway, I think. in Confederate army the Corps Commanders were Lieutenant Generals - generals of all corps. then where Major Generals - generals for divisions. in Union both (commanders of corps, commanders of divisions) had the same rank Major General, but there were still difference between corps commanders and division commanders. do you think about cavalry? add them any importance maybe? will look at the map more later. Oneyed wrote: the generals would be sorted anyway, I think. in Confederate army the Corps Commanders were Lieutenant Generals - generals of all corps. then where Major Generals - generals for divisions. Oneyed wrote: do you think about cavalry? add them any importance maybe? I did not mean to differentiate them only. but add them another role, maybe for Corps commanders add another bonus. try to think about any strategic role for them more as just simple bonus. it was common that who won cavalry battle he used cavalry for any attack from behind or so... lets think about this map more as strategis as bonuses, I think. this was just end of battle. but your map shows 3 days of battle. I am off now fro longer time, when I will come home I will post any draw. Oneyed wrote: this was just end of battle. but your map shows 3 days of battle. Did all the leaders of the American Civil War have such awesome beards? 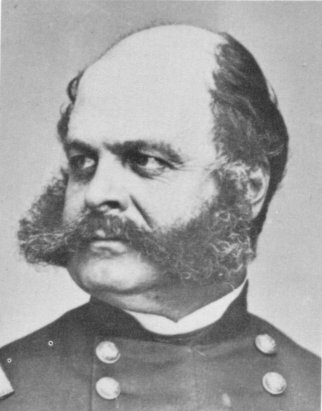 ManBungalow wrote: Did all the leaders of the American Civil War have such awesome beards? I've been busy with a couple other things Pamoa. I promise to look at this one in the next few days and provide some gameplay feedback. First things first, and I know I haven't posted in this thread much, but this is a very nice looking map. Ok, first, I think you need to remove "The Gettysburg Campaign" from it's current spot, make it stand out on it's own. It's supposed to be an introduction to the map, but right now it sort of gets muddled in with all of the gameplay instructions. 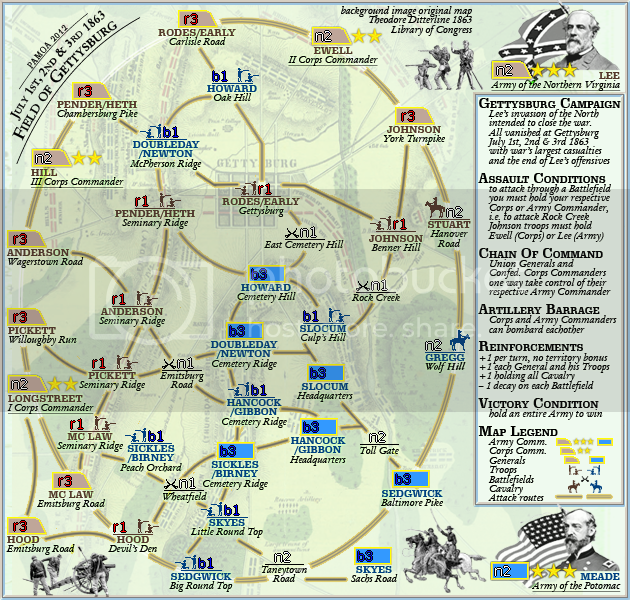 I don't like that Lee can only be attacked by 3 regions (Ewell, Hill, and Longstreet) while Meade can be attacked by 7 regions. Even more unbalanced is that those 3 regions are then protected on both sides. It seems Meade is significantly more vulnerable to the rest of the map, and thus his bonus easier to break. I think the legend needs quite a bit more sorting as well. For instance, break each of the Map Legend components out separately and indicate what they can do in their own little box, as opposed to how it currently is. What are the dimensions of the map? I think it could stand to be enlarged a little bit so that things aren't so congested and that your legend markers (Troops, Battlefield, Cavalry, etc) can be a little easier to distinguish. I'll admit I wanted to get something posted tonight because I haven't posted anything in a while, so that's a start. I will try to look closer at things soon, see if things make more sense when I'm not tired . nolefan5311 wrote: First things first, and I know I haven't posted in this thread much, but this is a very nice looking map. nolefan5311 wrote: ... this is a very nice looking map. trinicardinal wrote: An extremely nice looking map at this stage. nolefan5311 wrote: Ok, first, I think you need to remove "The Gettysburg Campaign" from it's current spot, make it stand out on it's own. It's supposed to be an introduction to the map, but right now it sort of gets muddled in with all of the gameplay instructions. 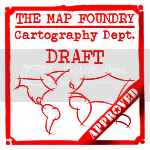 nolefan5311 wrote: What are the dimensions of the map? I think it could stand to be enlarged a little bit so that things aren't so congested and that your legend markers (Troops, Battlefield, Cavalry, etc) can be a little easier to distinguish. 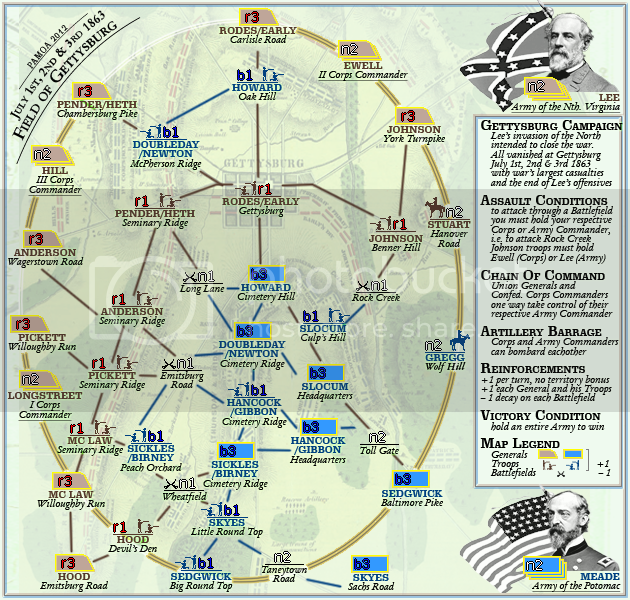 nolefan5311 wrote: I don't like that Lee can only be attacked by 3 regions (Ewell, Hill, and Longstreet) while Meade can be attacked by 7 regions. Even more unbalanced is that those 3 regions are then protected on both sides. It seems Meade is significantly more vulnerable to the rest of the map, and thus his bonus easier to break. pamoa, from me a couple of things. In assault conditions can you swap the army and corps commanders around. Army commander seems to be higher in rank so should come first. Secondly, do you have room to increase the text size at all. I am finding it slightly hard to read at the moment (not imposable) but with the conditional border, it might be nice to see if the text itself can become easier to read. It might be the italics.